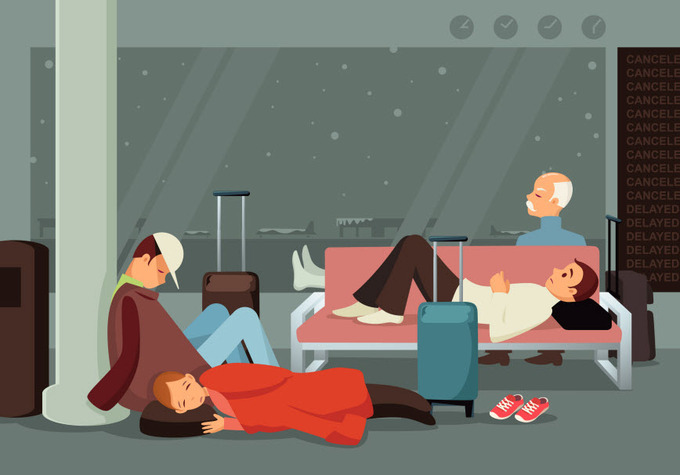 As the weather turns nasty this winter, travelers will often find themselves trapped in monotonous airport concourses, waiting for flight out. And even in the best of circumstances, travelers need an oasis from the crowded food courts and overpriced shops that litter today's airports. Airport lounges offer these refugees, as well as prompt access to airline customer service agents as well. The going rate for a lounge membership is around $500 per year, or about $50 per person for a day pass. Thankfully, airport business lounge access has become a benefit of many different credit cards, but these memberships differ substantially from each other as applicants need to understand before choosing a card. The first thing to understand is what types of lounges are included in a membership. Airlines such as American, Delta, and United offer lounges under their own brand, while there are other third party facilities at some airports that can be accessed through networks such as Priority Pass or Lounge Club. In general, most of the airline lounges are at domestic airports, while third party lounges have far more locations in foreign countries. To gain access to an airline's proprietary lounge network as a credit card benefit, cardholders will typically need to acquire an airline's top of the line card. These cards include Delta's SkyMiles Reserve card from American Express, the American Airlines AAdvantage Executive card from Citi, and the United Club card from Chase. The United Club card has an annual fee of $395, while the American and Delta cards that offer club access have annual fees of $450. Considering that these memberships typically sell for $500 or more, this benefit is a major component of the value proposition of these cards. In fact, those who would purchase a membership in an airline lounge program would almost always be better off applying for an airline credit card instead. There are also several different cards that offer access to third party lounge networks. The Visa Black from Barclaycard ($495 annual fee) offers unlimited access to lounges in the Priority Pass Select network, while the Diners Club Premier ($100 annual fee) and Elite ($300 annual fee), offers unlimited visits to lounges in the similar Diners Club network of third party lounges. Chase Palladium cardholders ($595 annual fee) receive access to the Lounge Club network, while holders of Chase Ink Plus and Ink Bold business cards receive two free visits each year, and discounted future visits. Additionally, there are two cards that offer memberships in both airline and third party lounge programs. The Citi Prestige offers access to both American's lounges and those that are part of the Priority Pass Select network. The American Express card offers memberships to the Delta SkyClubs, the Priority Pass Select network, and exclusive access to its own Centurion Clubs. Finally, cardholders need to investigate how many guests or family members can join them at no additional charge. For example, the Priority Pass Select membership that comes with the Citi Prestige card allows guests and family members, while Delta allows only the cardmember access. When cardholders take the time to investigate the airline lounge benefits of credit cards, they will find the right product to rescue themselves from the agony of long waits today's airports.